← Is a Slanket bad for your relationship? Fast forward ten minutes, to the Marks and Spencer’s changing room, and there was nothing pleasant about the experience. The lighting was so bright and artificial, that every one of my imperfections was magnified into a frighteningly clear view; I looked like one large mass of saggy skin, stretch marks and cellulite. Nice. As I left, I felt pretty low about myself and spent the rest of the afternoon planning to never eat Green and Black’s again, and to step up my exercise regime to Gwyneth Paltrow levels. I realise I can’t blame my body insecurities on M&S, but come on, would it hurt to have some slightly more flattering lighting? I don’t know the marketing strategies for these stores, but I am pretty sure I am at the top end of the age bracket for Topshop – so yes, in a shop that normally points its mirrors at younger, prettier, more nubile flesh, they have managed to find lighting that isn’t cruel. But in a shop, where I am more age appropriate, but certainly not the oldest shopper in there (and at a size 10, probably at the lower end of the size of shopper), where perhaps a little more kindness is needed, I was met with ‘kill me now’ lighting. But what really amused me, was the juxtaposition of the M&S changing room experience with their current advertising campaign: For Every Woman You Are. The celebrity faces have been ditched (gone are Twiggy, Dannii and Myleene) and instead there are a group of models of all shapes, sizes and ages (from 20 to 57, and from size 8 to 16), to represent ‘normal’ women. I’m all for celebrating the wonderful variety of women out there, but in their celebration, M&S have not ditched the airbrush. One of the adverts within the current campaign features the women wearing underwear. Yes, they are all different shapes, sizes, and ages, but there is not a stretch mark, or a hint of cellulite in sight. And that’s fine, this is advertising, I get it. Imperfections are not seductive. But they are not in the changing room, either. I know I am not perfect, and I don’t expect to step into a changing room and look like an airbrushed model, but I would like to look less awful – and I suspect other women shopping feel the same. So until the alarms in Topshop do go off, and I am physically removed, you will find me seeking comfort with kinder lighting. Anyway, I’m way too cool for M&S. Way. I’m all for flattering mirrors too! Happy customers, more likely to buy and winners all round. YES. Why don’t ‘they’ get this?! 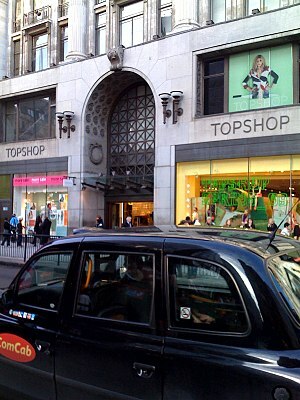 I think Topshop is a fabulous shopping experience: I always think it’s like a sweet shop of fashion. We have a large store in Nottingham and it’s always merchandised beautifully – it even has a Kurt Geiger within. And the staff are always so helpful (and if they do think I’m too old, they don’t let it show in their eyes!). Oh Jo, I love this! But surely one of those laughing should have been kind enough to get the traumatised you a big fat piece of cake? !